The Jaguars signed Flowers from their practice squad on Friday, Phillip Heilman of The Florida Times-Union reports. Analysis: Flowers signed with Jacksonville's practice squad in mid-December and now garners a spot on the 53-man roster. The undrafted rookie has an outside shot to make his NFL debut versus the Texans on Sunday. Flowers was signed to the Jaguars' practice squad Tuesday, Daniel Popper of The Athletic reports. 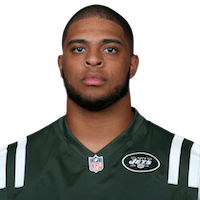 Analysis: Flowers was unable to make the Jets' active roster as an undrafted rookie earlier this year, but he'll have a chance to prove himself as a versatile fullback on the practice squad in Jacksonville. There are no videos available for Dimitri Flowers. Click here to view all videos.